You can search our knowledge base articles, browse public discussions, or create a new discussion if you're having trouble. Click here to view the Whistle FAQ. Thanks. We're really happy to have you with us. You should have received an activation email. If you haven't, check your spam filter really quick. If it's not there, click here and we'll send another one. Once you click the link in that email, give us a few minutes before you try to make a call. We're setting up your number. After that, open up Whistle, click the Account link on your app, log in to your account, and then you should be good to go. Make sure your account has been activated and you've given us five minutes to get your number ready on our systems. Click that account link on your app and log in. This provides the phone with your most recent information. You may have to enter your password one more time for security purposes, but you should be able to make calls. If not, let us know. One other quick thing you can take a look at before getting in touch with us: Make sure that the number in the pop-up authentication box is your number. If not, you'll need to correct that in Settings (iOS), Preferences (Mac) or Settings (Windows). Having audio problems on your Whistle calls? Whistle works by transforming your voice into milliseconds-long packets and sending them over wireless or cellular data networks. (We sent these packets via a protocol called SIP.) This works really well most of the time. However, these networks can be of varying quality. And wireless routers can block or mangle our SIP voice traffic. Whistle depends on consistently available network connectivity to provide good call quality. Unlike most data on the internet, the packets for a phone call need to arrive in order and as close to real time as possible. Case in point: you don't care which part of a graphic on a web page loads first, but you need the words in a sentence to appear in order. Since our phone calls don't use much bandwidth, the important thing is that your connectivity can deliver audio at a consistent rate. Even though you might have decent throughput or bandwidth on your wireless or cellular data network, that doesn't mean your Whistle calls will sound right. So, we need to test your network consistency and latency. We suggest using the pingtest.net web page. (Unfortunately, it requires Flash, so you won't be able to run it on your iDevices.) Please run the test several times in the areas where you use Whistle. If you grade at B or above in every one of these tests, your connection likely isn't the source of call quality issues. If you grade lower than a B, or grade higher than a B but are still having issues, or if your scores vary widely from test to test, it may be a router issue. search the net for your router brand and type and the phrase "SIP ALG". ALG stands for "application level gateway" and that router technology can interfere with our packets. If you find that your router uses it, follow any instructions you find to turn it off. make sure that your router has ports 5060 and 57842 − 57845 open. These are UDP ports; that's the protocol we use to for packetize voice. How to enable those ports varies widely from router to router, but a net search for your router's name and "ports" typically provides that information. If you make these adjustments to your router and are still having issues, we suggest speaking with your internet provider. They should be providing you with consistent ping times of less than 50 milliseconds and jitter of less than 3 milliseconds. If your stats are higher, please contact them. If the issue definitely isn't with your internet provider, please get in contact with us and we'll take a look. 3G data connections do not remain connected from cell tower to cell tower like normal cellular phone calls. If you start a call while connected at one tower and then move out of range of that tower, your call quality will deteriorate and the call. It's highly likely you will exp over 3G connections when driving or traveling long distances. This is nearly a sure sign that your wireless router is blocking traffic. take a look at your router. Specifically, you'll want to search for your router name and SIP ALG. ALG stands for "application level gateway" and that router technology can interfere with our packets. It's best that you turn it off in your router. If neither of these steps resolve your issue, please get in contact with us and we'll take a look. 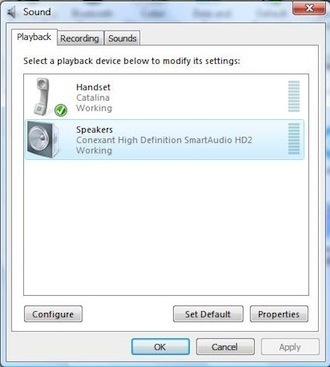 Windows allows you to set your microphone and speaker. We'll walk you through that process so it's not an obstacle for Whistle. Go to Control Panel from the Start Menu. In Control Panel, select Sound and Audio Devices. You'll see a Sound Playback drop-down. For this, select the speaker you'll want to use with Whistle. 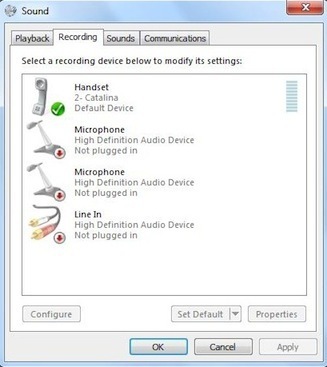 In the Sound Recording drop-down, select the mic you'll use with Whistle. 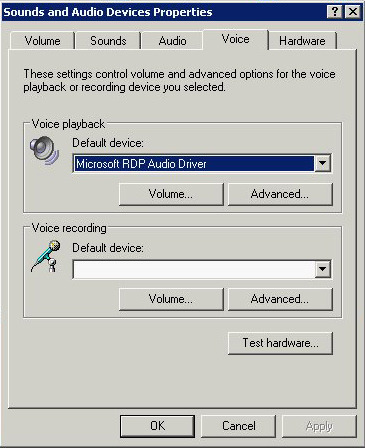 IMPORTANT NOTE: We highly suggest using a mic-enabled headset for both your speakers and mic with Whistle. This helps prevent echo. 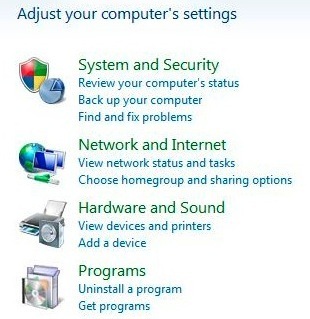 Go to Control Panel from the Start Menu (the circular Windows icon). In the Playback tab, select the speaker you'll want to use with Whistle. When you've done this, click the Set Default button as well. 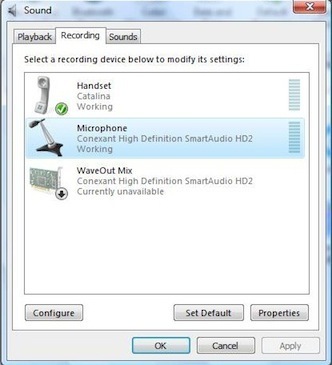 In the Recording tab, select the microphone you'll want to use with Whistle. When you've done this, click the Set Default button as well. 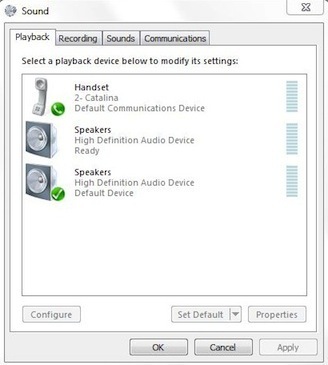 In the Hardware and Sound window, under the Sound heading, click Manage audio devices. A Sound window will pop up. 25 Mar, 2019 04:23 PM I want to delete my account.